The youngest of this ocean floor can be gradually removed to allow the remaining ocean floor to be joined together, but these areas can only be completely joined if the size of the Earth is reduced. The rotating globe below starts at 120 Million years ago with all the oldest ocean floor removed and the size of the Earth reduced to allow the ocean floor and continents which existed at that time to join together. The globe then gradually increases in size as new ocean floor is created. This globe can be compared with many other Expanding Earth reconstructs available on the web and elsewhere. [4-6] I would urge everyone to try reconstructing their own globes to test the Expanding Earth concept. Even a simple reconstruction, which may only take a weekend to complete, can illustrate how well the ancient continents and ocean floor fit together on a smaller diameter Earth. It is compelling evidence that these reconstructs are a valid observation that needs a scientific explanation. Consider how unlikely it is that the entire ocean floor fits together so precisely to form a complete smaller diameter sphere. 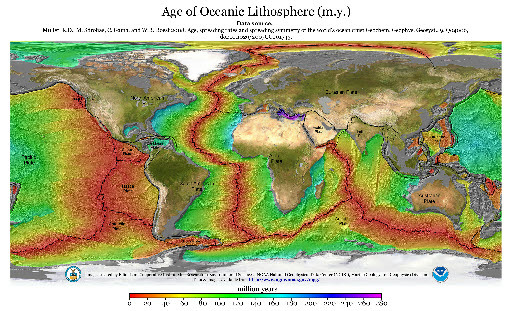 If the missing ocean floor had been generated by any other process than an Expanding Earth it would be highly unlikely that the areas were the exact shapes required to reconstruct a smaller Earth. It would be more likely that irregular shapes would have been left. It would be similar to arguing that a jigsaw puzzle fits together by chance. It would be even more remarkable if this process could be continued further into the past but this is exactly what happens.